More Stampin Up Blog Candy! 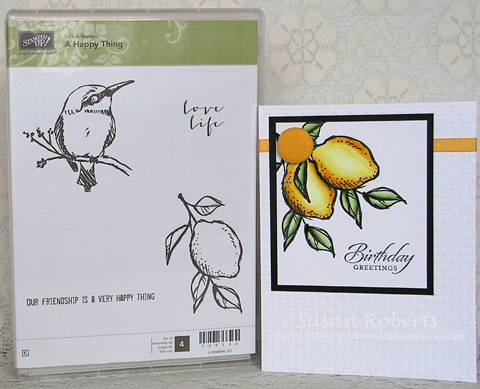 For the main image the lemon was stamped, masked and stamped again. For just a little dimension a third lemon was stamped, colored, cut out and then adhered to the main image over the front lemon. 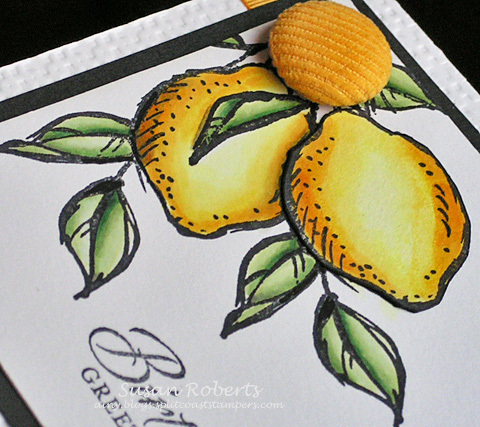 TIP: The coloring of the third lemon included using a black Copic Marker on the cut edge. I think this gives a more finished look and helps the cut image stand out even more. Isn’t this the sweetest set. You can win this brand new Stampin Up set called, “A Happy Thing,” by leaving a comment below on this post. Begin your comment with the word “Candy.” A random entry will be drawn on Saturday, February 14, 2015. You can find more of my blog candy HERE. Candy is yummy! Thanks for the chance to win bog candy! Love your wonderful, bright lemons. Makes me feel like Spring is around the corner. Thanks for joining us at Seize the Birthday! Gorgeous card! Such fabulous coloring!! Great design! This is so stunning, I just love the colors! Candy is sweet, just like this card. Very nice card indeed. Thanks for sharing and for the chance to with this blog candy. Ooooh, that’s a pretty card! I’ve got a thing for yellow and white, anyway, but this is just so clean and crisp and pretty. You are much sweeter than a lemon to be sharing this blog candy! Candy – that sounds perfectly sweet to me! I love this image and how you dressed it up with that corduroy button accent! So pretty! love that bird, so sweet! CANDY! Thanks for the chance to win this SAB set! Although I have it for myself already I would so like to win it so that I can send it to a dear friend in California [I now live in Arizona]. That way we can Skype and create cards with it together! I love what you did with the lemons and outlining them. I don’t have this set yet but hope to!!! Candy is dandy but stamping is sweeter!! 🙂 Your card is lemon yellow sweet and I love the set! Thanks so much for the chance to win! Candy. Love the card. Thanks for the tip about the edging. Wonderful idea. Loved the corduroy button too. Adds more lemony goodness to the design. Thanks Miss Rainy for sharing the talent…and the goodies. Hugs. Candy! I love candy!! I love your card too! Great top to use the black marker on the edges of the lemon. Love how you added dimension to this beautiful card! Oh Susan this is beautiful and such a wonderful CAS design. You really worked your magic bringing the lemons to life. Beautiful card featuring fabulous coloring! Candy…. love the coloring and use of the marker does make a difference, just be careful the pen doesn’t slip and go onto your image, ask me how I know that 🙂 Love the texture in the button too! Candy – specifically blog candy, Love it! Love this card too. Makes me think of spring time, which I can hardly wait for! Candy is handy to eat when you are staying up late trying to finish Valentine cards for work. LOVE your work and following your blog. The ideas and techniques used as well as the color choices are a great inspiration to me. Thanks……the lemons turned out wonderful by the way. Candy- cute little set, love the bird! Candy is perfect for today because it is so sweet. 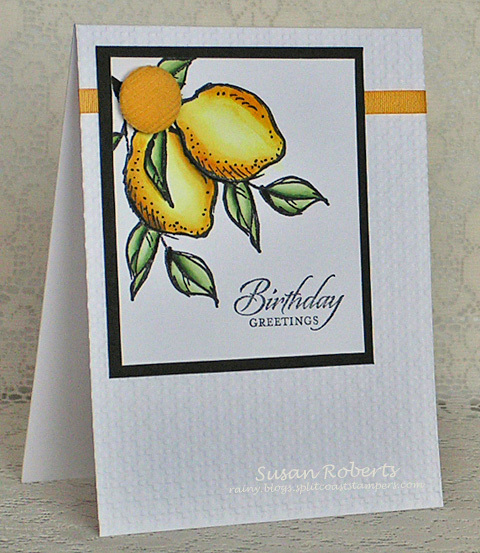 Love the lemons on your card even though they may be sour!